Robert Brown successfully defended his thesis, “Methods and Models for the Analysis of Human Genetic Data,” on Wednesday, May 24, 2017 in Boelter 4760. His talk, which is posted on our YouTube channel ZarlabUCLA, discusses methods to better assess how human history affects genetics and how genetics affect human phenotypes such as height, eye color, and disease risk. Dr. Brown’s thesis presents five novel methods that build upon each other to analyze today’s large-scale human genetic data. Dr. Robert Brown with his thesis committee. 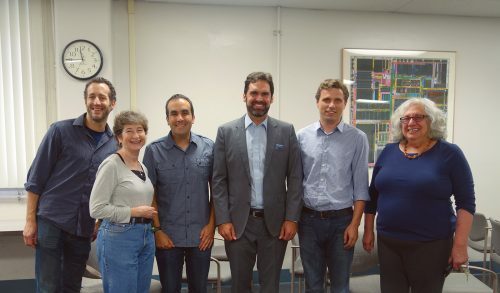 (L-R) Kirk Lohmueller, Janet Sinsheimer, Eleazar Eskin, Robert Brown, Bogdan Pasaniuc (committee chair), and Rita Cantor. In: Bioinformatics, pp. btx142, 2017. In: European Journal of Human Genetics, 24 (1), pp. 113-119, 2016. In: Eur J Hum Genet, 24 (1), pp. 113-9, 2015, ISSN: 1476-5438. In: PLoS Computational Biology, 10 (4), pp. e1003555, 2014.